A golf glove should "fit like a glove" -- snug but not tight. Golf gloves come in many sizes, for women, men and young players, for left-handed and right-handed players. Sizes are determined by the shape and size of the hand, and some gloves are manufactured with players with smaller hands in mind, those players whose needs fall through the cracks of usual golf glove sizes. Gloves come in many colors and styles, with white a very popular color. The largest market for golf gloves is for men. Some players might select a golf glove only because a favorite professional uses the style and branch, but selection is more likely determined by appearance, style and fit. Gloves come in two main size categories, regular and cadet. Both categories have gloves in sizes small, medium, medium-large, large, extra large and double extra large. Some companies even cater to a wider market and offer triple extra large sizes. The most common sizes of golf gloves for women are small, medium, medium- large, large and extra large. Women's gloves are available in a wider variety of fashion colors and prints. Some manufacturers even offer gloves without fingertips or with slits for long fingernails. For junior players, changing body shapes factor into selecting a golf glove. Cost and durability also also important, but must be weighed in proportion with how long a player will be able to use a glove before growing out of it. Manufacturers offer a youth gloves in small, medium, large and extra-large sizes, but some also offer expandable gloves to cater to those concerned with growth in a young player. The sizing also tends to vary widely, so one company's medium junior gloves could be considerably smaller than a medium glove manufactured by a different company. 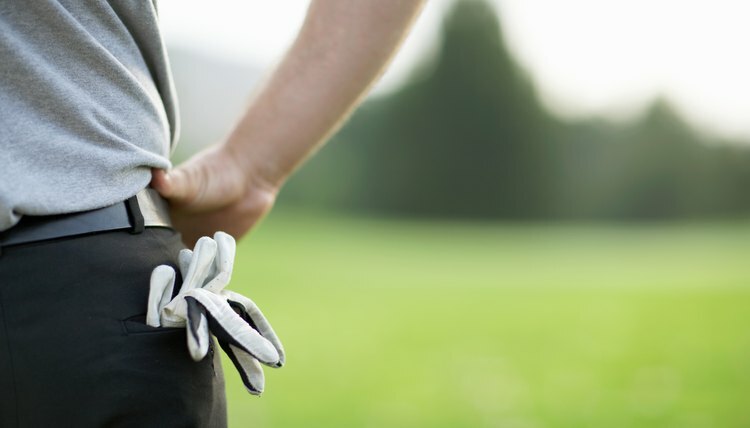 When paying for a golf glove, golfers need to make comfort and fit as important as cost. Shape is the difference between a regular and cadet glove. Regular golf gloves are intended for people with proportionate fingers and palms. Cadet gloves are best-suited to people with shorter fingers and wider palms. Feel is also an important factor in gripping a golf club, and players should match gloves that fit and feel best with cost concerns.